KERNOWPRINT Dry Toner products are perfect for all types of outdoor sports and recreation applications -waterproof and tearproof straight from the printer. As a major supplier for running bibs for charity events and races, KERNOWPRINT Dry Toner prints hold up against sweat, heat, and dirt. Whether it’s a marathon or a quick mud challenge, your race numbers will outlast any event. 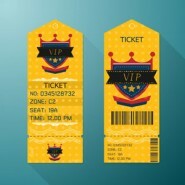 Add an extra layer of protection to your VIP passes and event tickets. Tear-resistant and easily recognizable passes made from KERNOWPRINT Dry Toner can protect from counterfeits and can be attached to a lanyard for durable and lasting passes that hold up to the longest conferences and loudest concerts.